Dozens of emails obtained by the Tribune provide a rare peek into the private deliberations of Gov. Greg Abbott. The emails paint a portrait of a chief executive more interested in the nitty-gritty of state policy than what’s known of his predecessor. The governor hit the send button just before midnight. It was his sixth day on the job and he was feeling the weight of tragedy inside the state’s foster care system. The email, sent on Jan. 25, is one of dozens obtained by The Texas Tribune under state transparency laws. Taken together, they provide a rare peek into the private deliberations and impulses of a politician who carries around his caution like a shield. Abbott's press office declined comment Wednesday. In emails sent during his early days in office, Abbott comes off as far more interested in the nitty-gritty of state policy and the internal workings of government than what’s known of his predecessor, Rick Perry, a born delegator who generally let underlings fret about the minutiae of speech-making and letter-writing. It’s also apparent that Dave Carney, the former Perry hand who guided Abbott to a blowout victory last year over Democratic Sen. Wendy Davis, is more involved in major policy discussions than many might think. And while Abbott has taken a far more cautious and aloof approach to the news media than Perry did, the emails suggest he cares deeply about perceptions that Texans and his fellow elected officials have of him. It's not the only email demonstrating Abbott's attention to the image he is conveying through the news media. Writing an email after midnight in late January, Abbott told his communications director, Matt Hirsch, that he should “pick a strategic time” to roll out new open government standards that he had promised as a candidate for governor. Abbott Chief of Staff Daniel Hodge responded a few hours later that the governor’s office had begun retaining emails for 30 days — up from seven in the Perry administration — and had named a new public information coordinator to handle requests for records. When he was on the campaign trail, Abbott had promised to do both. In his response to Hodge, the governor seemed eager to trumpet those developments. At the same time he was discussing how to push positive stories in the media and fix the state’s ailing foster care system, Abbott was fretting with his inner circle about how to best take advantage of the publicity he would spark with a proclamation declaring Feb. 2 “Chris Kyle Day,” in honor of the late Iraq War veteran of American Sniper fame. The “BIG QUESTION,’’ he wrote in all-caps, was whether or not he should announce the big day ahead of time — at a speech before a veterans group — or just on Chris Kyle Day itself. A little over an hour later, Abbott — who had spent 12 years as Texas attorney general — marveled that he alone could determine the hour and circumstances of his proclamation. Ultimately the governor went with Carney’s suggestion to get two bites at the apple, once at the VFW and again on Feb. 2. That’s not to say he always agrees with Carney. When Abbott proposed adding a wheelchair ramp to the prominent south entrance of the Texas Capitol, expanding access for the disabled beyond the less frequented north doors, Carney said it would come off as “self-serving” because the governor himself uses a wheelchair. “GA only cares about accessibility when it’s inconvenient to him personally will be one attack,” said Carney, using the governor’s initials. In another exchange, Carney downplayed the significance of the Harris County district attorney’s support for reforming the way grand juries get selected. Carney answered that the “current Harris County DA being for something does not mean it is gathering steam,” but agreed that the “legal shop” should work with legislative sponsors to get it right, “should it pop out” of the lawmaking process. The emails from the governor are striking on a number of levels, the first being that they exist at all. The communications were sent from both were provided to the Tribune in response to an official request. Perry used a private email account, but records of his electronic communications have rarely surfaced publicly. In 2008, for example, emails published in the Fort Worth Star-Telegram contained candid chat among top-level aides, but not Perry himself. Perry and his aides, though, were far chattier with reporters during his 14 years in office than Abbott and his team have been since he started running for governor in 2013. Since being sworn in on Jan. 20, the new governor — a lawyer known to immerse himself in the inner workings of state government and his own office — has continued to hold his cards close to his vest. It’s unusual to see his unscripted thoughts spilled out into emails. While Abbott’s office withheld many emails and heavily redacted others under a variety of asserted exemptions, the ones he did provide give rare insight into his day-to-day style of communicating with aides — often into the wee hours of the morning. And in some cases, they reveal policy ideas and views of the Legislature that haven't previously come to light. 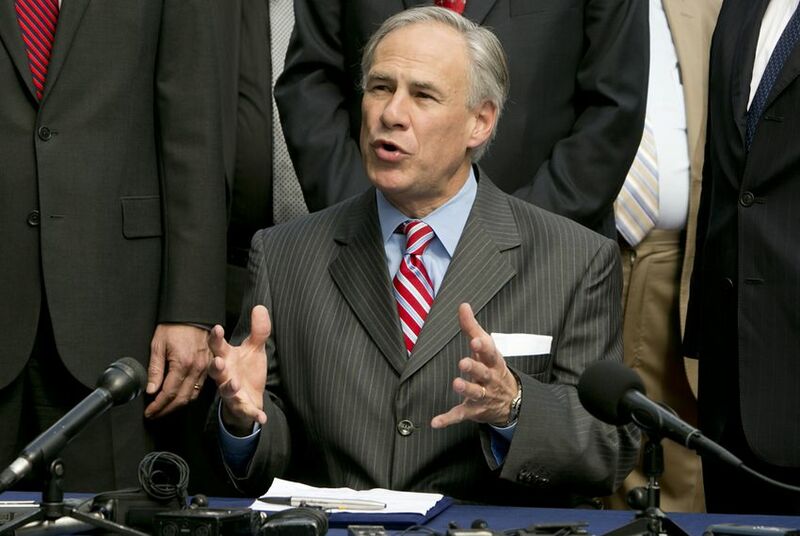 On the latter topic, Abbott expressed deep skepticism that state lawmakers would ever reform their own ethics rules right before he publicly urged them to “dedicate this session to ethics reform.” Specifically, on Feb. 1, Abbott presciently wrote that the Legislature would deadlock on the issue, and he told aides he would probably have to call one or more special sessions in order to focus the needed attention on ethics and get the job done. He was right that ethics reform would ultimately collapse, but there is no indication he has the appetite for specials sessions, saying more recently that he didn’t envision calling a special session for anything. The governor also signaled he’s not done with restraining the power of local governments to regulate affairs in their communities, an idea he began pushing in earnest in early January at a speech before the conservative Texas Public Policy Foundation. On that same Sunday night in late January when he grew wistful about the state of foster care in Texas, Abbott cited a proposal by Republicans in Congress to pare back regulations opposed by the Obama administration — and suggested it could be a model for the Lone Star State. While Abbott later signed legislation taking away the right of cities to ban oil and gas fracking within their jurisdictions, a law requiring legislative oversight of all local regulations would expand considerably the role of state government into the lives of Texans. It’s one of several examples in which Abbott throws out policy ideas, often in late-night email missives. “We have been panned for ditching the music director,” Abbott wrote. He was referring to the firing and replacement of Texas Music Director Casey Monahan — a move that riled many in the music industry. “We need to get the new one appointed,” Abbott wrote. “Then we need to get him on steroids and build an even better music program.” Abbott suggested creating a unique event, comparable to the New York Governors Ball, that might be limited to Texas musicians. Apart from instigating high-level policy discussions into the wee hours, it’s clear Abbott doesn’t mind writing his own speeches, weighing in on news developments or overseeing the drafting of letters and documents — whether it’s tweaking sentences or ruminating about the timing of some news release. When it came to the preparation for his State of the State speech to the Legislature in February, Abbott himself came up with a wordy first draft with detailed instructions to aides about where to begin trimming. He urged them to spend time helping him knock it out of the park. Asking for input and edits, Abbott said he didn’t want to make people “fall asleep like [U.S. Supreme Court Justice] Ruth Bader Ginsberg [sic],” but also wanted to deliver an address worthy of the moment. Abbott ends the email with advice that, based on the enthusiasm evident in his emails, he certainly seems to be following.